This is the design that started it all. Graceful minimalist lines created with what are even today state of the art components. The L series went on to define the company, inspire a generation, and totally revolutionize the guitar building business. Today the use of composite materials is commonplace - graphite reinforcing strips in necks, phenolic nuts. 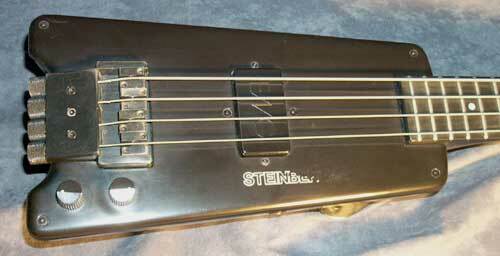 But when Ned Steinberger first introduced his bass in 1980 it was a ground breaking achievement. It's revolutionary design was inspiring to both artists and technicians alike. Musicians bought his instruments as fast as he could make them. His engineering peers bestowed praise upon his creation, culminating in a "Design of the the Decade" award from the Industrial Designers Society of America in 1990. The construction technique to produce these instruments is very involved and vastly different from traditional wooden instruments. 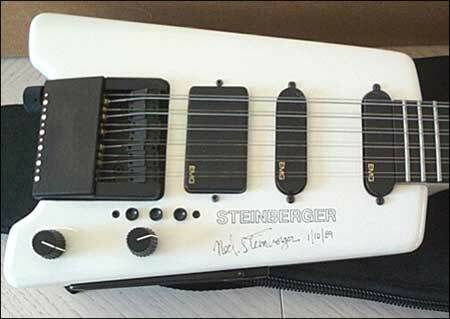 Click here for detailed instructions on how Steinberger L's were made. The high impedance models featured DiMarzio pickups and the low impendence ones were from EMG. From the beginning it was clear that demand for the active EMG models was strongest, and the DiMarzio configurations were dropped shortly after launch. Only a handful are in existence though we've yet to see one (if you've got one please send us some pics!). 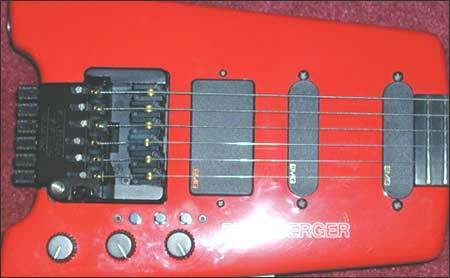 The L2's were by far the most popular, so the L2 model name then stuck to the Steinberger bass. Approximately 1500 L2's and less than 50 L1's were produced. A few of the earliest have an EMG pickup housing with the molded letters "EMG" on it, rather than the familiar small corner foil logo we know today. 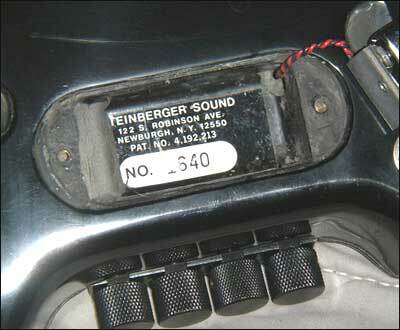 After that came the original EMG SS pickup (indicated by an 'SS' sticker on the bottom). 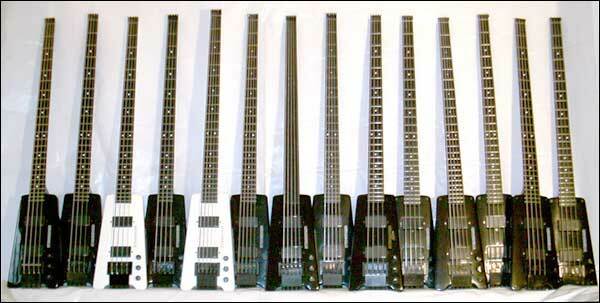 Click here for more history info on these special EMG bass pickups. An early L1 bass, serial #196. Note the EMG molded logo on the pickup. The silk-screened logo has worn. It's also interesting to note the early "P-" numbered GL's until recently were thought to be prototypes. It did strike us as odd that they numbered into the hundreds - rather high for true "prototype" runs. Turns out these were an advance run of the first 100 or so production instruments. This was relayed by Jeff Babicz, a former Newburgh employee who was hired early on and eventually became plant manager around the time of the Gibson buyout. He was on there on staff when the first GL's were made. Babicz recalled that in order to get the GL's going they did a quick run. All of these were hand made and "a little crude in the details", including the hand engraved numbering. He says they also made the "mistake" of adding Kevlar fibers in these early GL's. Though it made them incredibly strong they were almost impossible to cut, drill or saw when it came to finish them. This may also explain the unique tone and sustain of these instruments, coupled with the fixed bridge most of them sport. The necks on these guitars will probably never fail due to their incredible strength. The same basic XL/GL design was used up until Gibson ended production in 1998. Approximately 8000 of these newer L's (both GL guitar and XL bass) were produced. An old pic of Eddie Van Halen's legendary GL2T. Most notably heard on "Summer Nights" from the album "5150". This pic was taken in the Newburgh factory, right after it had been assembled. There are a few transitional L2/XL2 instruments that exhibit one or several newer/older features together. There are also some early GL's (mostly the 'P' numbered ones) that have what the factory staff referred to as the "front-loader" (bolts from front) faceplates. The vast majority of GL's however feature the newer "back-loader" design. By and large the specific features outlined above are a good rule of thumb to distinguish between the two versions. 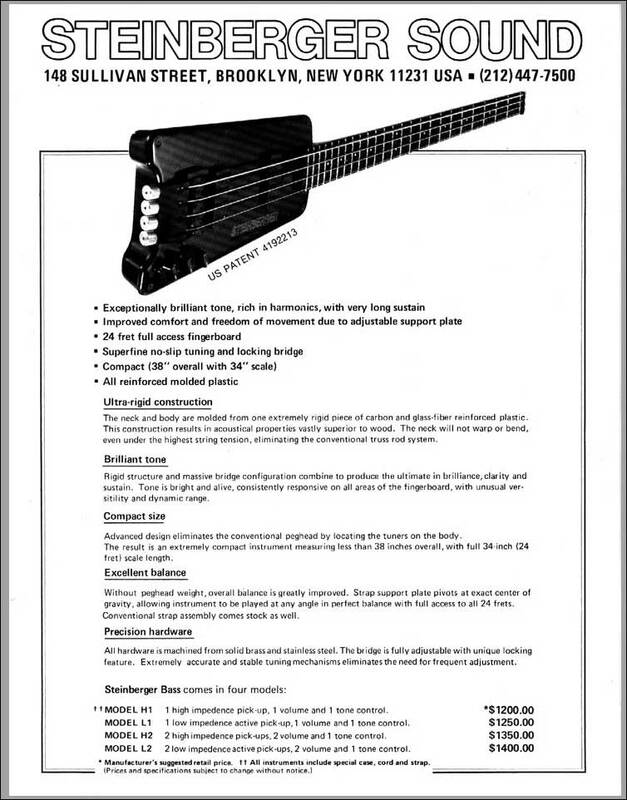 Also of note is that only the "2" bass pickup configuration (2 bass humbuckers) was offered on the XL, though many guitar variations were available throughout production. 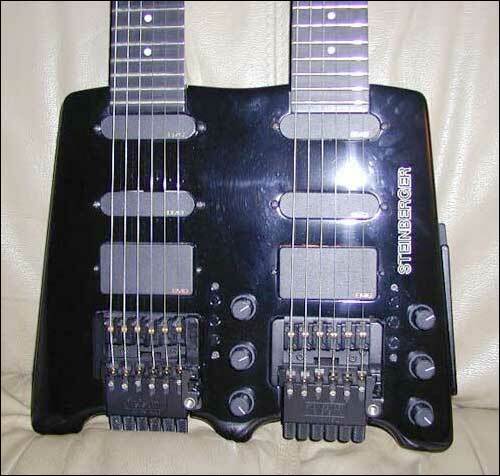 A Nashville factory constructed double neck GL4T. Also unusual because both guitars features TransTrems. The L series have the most widely varied options on them, as almost every single feature Ned designed was available on these units: TransTrems (both guitar & bass), S-Trems, 12 string bridges, DB bridges for bass, active & passive EQ, most pickup configurations - all were available options throughout the years. An employee owned white GL4-12 personally signed by Ned. The signature is not ink - it was engraved and filled just like the logo. This was also the first 12 string made: serial # P-12 001 and setup by Ned himself! By far most L's are black and by most estimations probably 90-94% of all L series instruments were this familiar basic color. White is second most common, with approximately 3-5% of the total. The remaining roughly 1-2% can be categorized as "other": red, blue, and even a custom silver run. These silver ones were created for a special Guitar Center promotion, and were actually black L's painted with a metallic silver top coat. Each one of their 30 stores (this was before they opened one up on every corner) received one guitar and one bass to sell.